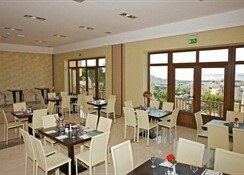 The pretty Forest Park Hotel in Crete is a lovely hillside holiday resort overlooking the town of Rethymno. From its elevated perch amongst the pine-tree covered slopes, it enjoys unsurpassed views across the rooftops toe the sea beyond. Quiet and family-friendly, this idyllic Cretan hotel is a great choice of accommodation for travellers to Crete. 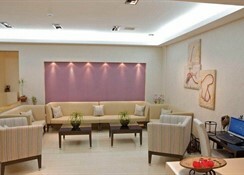 The hotel bedrooms are modern and well decorated, with cool colour schemes accented with bold statement colour. Bathrooms are plush and well designed, and the balcony offers superlative views from the privacy of your own retreat. Elsewhere, the hotel boasts a wonderful swimming pool for adults and a separate shallow pool for kids, as well as a relaxing sun terrace with a great panorama across the city. The pool bar serves light snacks and refreshments daily and the restaurant and cafeteria offer traditional and international dishes from their menus.